An enormous whale creature than can level a city by itself has taken its roots in religious teachings and biblical stories. This creature is called the Leviathan, and with it, it brings a story that any life is given a meaning as well as being used as a curator for God’s strength. Leviathan is a middle eastern Hebrew mythological beast that is first seen written in the bible. The Leviathan was an extremely large serpentine monster that was killed by God to provide food for the starving Hebrews during the time. The cause for Leviathan’s creation is surely a complex but simple one, as he does serve religious purposes and was created by whomever wrote the book of Jobs in the Bible. It is also simple because if it is looked at in a more factual standpoint, the Leviathan was created by God as a symbol of his all powerful creation. He was the one who created the large sea creature that could potentially have the power to destroy many things, but he killed his only creation of the Leviathan for the purpose of food. Even if it was not looked at from a “God’s creation” standpoint it shows greatly how the monster’s body is a cultural body due to the fact that the creation of this mythological creature dates back thousands of years ago in the middle east, during a time where this religion reigned supreme. Stories like this were created for the purpose of demonstrating their God’s power. Through the societal power of religion the Leviathan brought, the meaning behind the cause of its creation and its connection the modern society, the Leviathan shows that the cause of its creation, no matter how large or small, can have meaning even to those that are insignificant to their own body. The Leviathan was a monstrous whale who ruled the seas. He was created and destroyed by God to be used as food for the Hebrew people. This is what the biblical stories of the Leviathan showed, it showed the almighty power of God and his strength. It showed that what he creates he can just as easily destroy or kill. This is why thousands of years ago, the story of the Leviathan was an integral part of religion just as any other biblical stories. 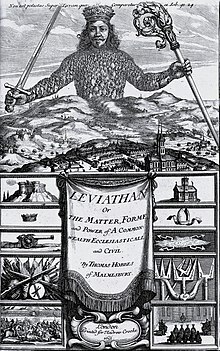 Meirav Jones, a researcher in political studies, references the book Leviathan by Thomas Hobbes, stating “By considering Leviathan in the religious context of the English Civil War, I do not mean to diminish the importance of other contexts that have been presented to date. I certainly do not claim the primacy of the religious context over others.” (Jones) It served the purpose of showing how strong their God is, whether it be for religious reign so that no one goes against the religion or if it were for a show off of how exactly powerful their God is. In a time where religion was a integral part of society, where it was a must, these stories showed how powerful the God they serve in the religion is. The Leviathan was a creature that was detailed to be scary enough for any regular people to be frightened by the thought of such thing existing, and thousands of years ago, stories such as this were believable to many by the fact that many mythological creatures were deemed to be real during the time simply because of uneducated views on the world. For such a creature to be created by God was a show of God’s power enough, yet for God to also destroy the very thing he created so easily so that his believers were fed, made it an even more frightening display. The meaning for the cause of the Leviathan’s creation is something that is a bit more complicated. Rather than taking a look at it from God’s perspective, its creation as a mythological creature is more viable. It is safe to say that such a beast might have been thought to exist and that people from the past has mistaken another marine animal as the Leviathan. But the Leviathan as it is known in the bible was created for the sheer purpose of not only God’s power but also for his generosity. Leviathan was supposedly one of a kind, it is the only one of its species that God had created, yet God killed it. It has such an enormous body that can feed so many of the people so he killed his only creation. It is somewhat even more meaningful when thinking about how he did not just create more of it afterwards. It is an example similar to the example set on the stories of Jesus. “Jesus, God’s only son perished for the sins of the world.” Likewise, Leviathan, God’s only creation of that monstrous species, died for the stomachs of the Jews. The story of Leviathan is still relevant today. It coheres to the third thesis of the monster theses’, “monsters are the harbingers of the category crisis.” Like said before, although Leviathan was known in biblical stories as a large whale like creature in the water, he could not be counted as one, and would therefore fall into this thesis. This is significant similarly to how the idea that he was God’s only creation because of what it represents today. In modern society we are each our own Leviathan’s, we are all one in the same whether it be our species or race, or even our names, we fall into different “categories” just as Leviathan is also “technically” a whale, but we each fall to our own different crisis of what our psyche wants and desires to what we actually are. It can be anything such as talent, looks, or personality traits, we each have a certain category crisis we go through, as if we want to be or have something that “everyone” else has. But in truth the story of the Leviathan is a life lesson. We can go through saying how it affected religion, how it symbolizes God’s strength, but it is more than that. Christopher Scott McClure, a professor from Harvard University also backs up this idea but stating in an article that was also based on Thomas Hobbes Leviathan “The specific problem the need for soldiers presents to the strictly egoistic system Hobbes presents runs as follows: the citizen, who enters the commonwealth as an individual primarily concerned with his own preservation, can never identify with the community in a way that would make the sacrifice of life seem entirely reasonable or desirable.”(McClure) This is true of the same category crisis stated in the thesis. This crisis is cause to many of these ideas that keep people separated, but behind all that, the Leviathan’s creation teaches those that even though every individual person, animal, or plant on this world is different, and that some individuals want to be more like another group or “category,” every one of those individuals play some kind of role in the universe, and each of those individuals roles are important, from the largest individuals such as the Leviathan, whose creation served the Jews, to the smallest individuals, such as the humans that feasted on the Leviathan’s meat, which is a somewhat significant idea that even the seemingly larger individual, in size, strength, or status, can be used to serve the smaller ones. The Leviathan is a monster with incredible size and strength. It would be one of God’s largest created organisms. Its creation is a teaching for all those who follow the religion as well as a show of power to those who choose to go against or detest the religion. But even now, as time has past by and ideas shifted, the Leviathan’s creation is relevant in today’s society, as a lesson to all the people of the world that it does not matter how large or small an individual is, or how high ranking another is, all serve a purpose in the world, whether it is for the weak or for the strong. The Leviathan is a monster that rises above many other monsters in terms of meaningful and symbolical significance and its creation as a monster has shown throughout the thousands and thousands of years that it has existed, how exactly it has influenced the society and those who have heard its stories in legend. Politics of Hobbes’ Leviathan in a War of Religion.” Political Studies, vol. 65, no. 1, Mar. 2017, pp. 248–263. EBSCOhost, doi:10.1177/0032321715619941. Hobbes’s Leviathan.” Journal of Politics, vol. 76, no. 1, Jan. 2014, pp. 114–125. EBSCOhost, doi:10.1017/S0022381613001072. Journal of the History of Ideas, vol. 76, no. 2, Apr. 2015, pp. 259–270. EBSCOhost,chaffey.idm.oclc.org/login?url=http://search.ebscohost.com/login.aspx?direct=true&db=a9h&AN=102238870&site=ehost-live. Previous Previous post: Is the 200th Time Enough?